Pierate - Pie Reviews: Will you Vote Pies at the General Election? 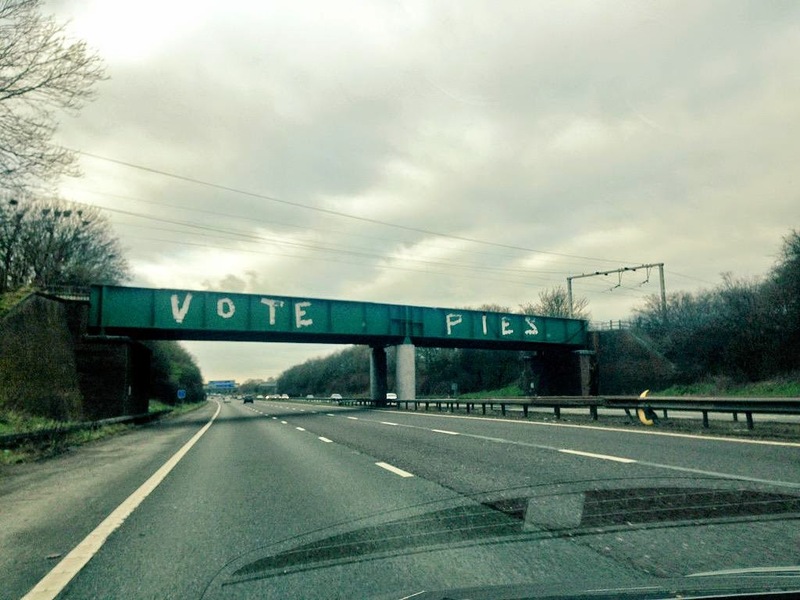 After "The Pies" Road Graffiti it's "Vote Pies" now! 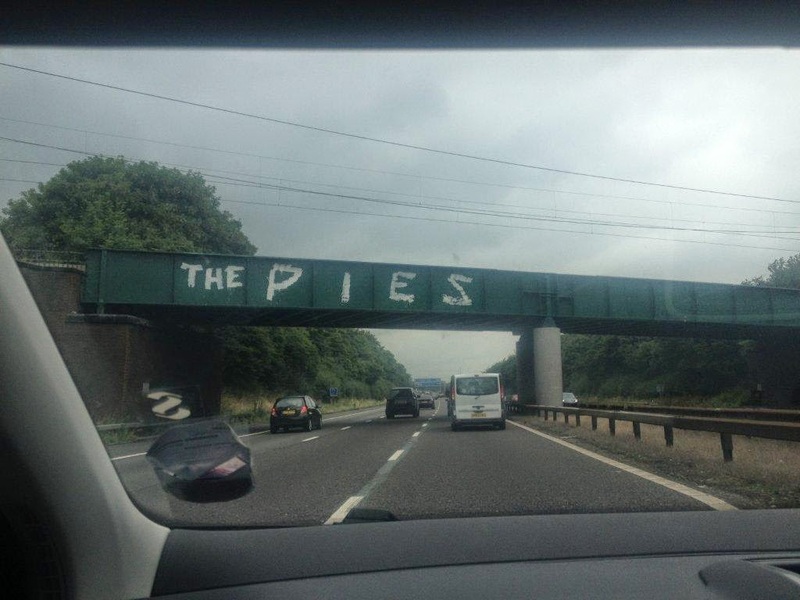 You may recall that in July 2014 we Pierateers felt the need to clarify that we were NOT behind a "The Pies" bit of graffiti on a road bridge across the M6 near Chester (between Junctions 17 & 18), an article which over 1,000 of you have now viewed! Having been queried by a colleague at work (yes, sadly Pierateering is not quite a full time profession just yet!) who had taken the photo below on the motorway towards Chester, we officially confirmed we were not doing a Banksy and adding pie signage to road bridges up and down the country. If we'd been thinking of doing such a thing, we would certainly have been a bit wittier and put "Pierate" or "Who rate all the Pies?" or similar! It did however lead us to investigate why this "The Pies" graffiti was probably there! But now, thanks to a tweet by Anna Evans it appears that those behind the railway bridge graffiti have gone all political on us, changing the wording to now say "Vote Pies" - something we can really get our teeth into! After all, we've rated almost 500 pies on our pie review blog, so surely no-one has got behind the pies as much as we have! So if you're still chewing over all the election literature and deciding who your pie-litical vote should go to, perhaps we should all just get behind the pies instead! After all, we certainly don't want to see quiches, tarts or pasties getting into power! In other pie-litical news, we were saddened to hear the news from pie e-petition founder Biltawulf that the petition to make it a crime to serve a top-crust pie has been closed due to the upcoming General Election. However we were pleased to see that thousands of you had signed it and thus backed the fully encased pie, which we fully support (as can be seen in our pie dictionary definition)!